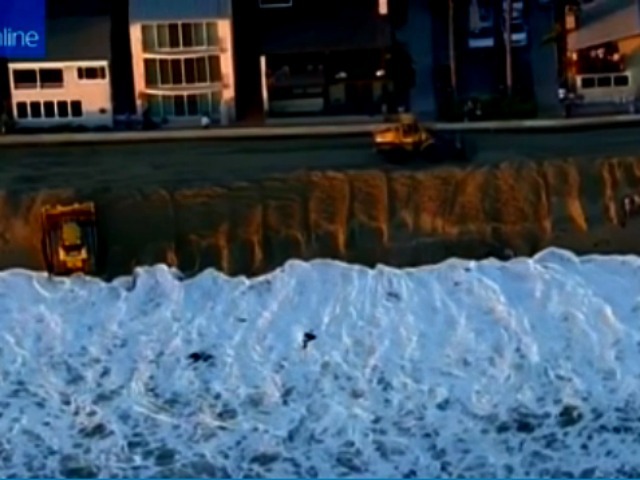 Huge waves racked the Malibu coastline on Friday, undermining the foundation of many multimillion dollar homes of the rich and famous. Unfortunately, due to the extreme nature of the erosion over the years, the homes have little chance of remaining in place in the long run. This comes in the face of huge efforts by billionaire homeowners, who have spent millions on securing a sea wall to protect them, reported the Daily Mail. Over the years, the beaches have virtually disappeared, and now the very underpinnings of the structures are threatened by the encroaching tides. Steven Spielberg, Dustin Hoffman, and Goldie Hawn are currently fighting for approval of a $20 million scheme to shore up their coastline at Broad Beach just north of Malibu. According to TMZ, the current set of gigantic waves are hammering exclusive communities inhabited by Tom Hanks, Pink, Diana Ross, Nicolas Cage and a slew of other big stars. Rising sea levels are more than just an annoyance, as they engulf the coastline and swallow the beach along Malibu Colony, the gated community home to some of the biggest celebs in the country. The California Coastal Commission has come down hard on a some of the more elite communities for extracting sand from other beaches to use for reinforcements for their own beach. In 2005, 108 properties were ordered to stop taking sand from public beaches to erect protective sand walls for their beaches.